A sausage truck! In the burbs! Say what??? Yeah, I was floored too. 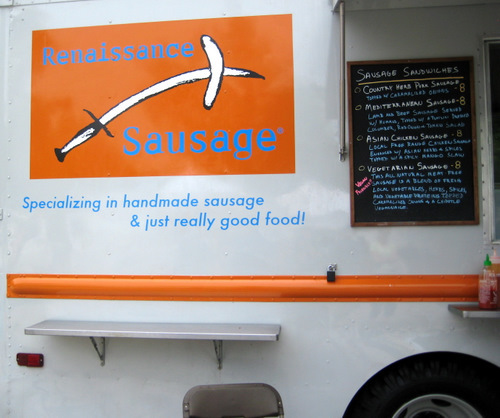 Well, the Renaissance Sausage Truck, usually in Philly proper, will be stopping by the Bryn Mawr Farmers Market on their regular saturdays. While the farmers market itself is kind of depressing, this is certainly a welcome addition as I could easily tell by the swarm of people that showed up. Maybe not a swarm in Philadelphia, but certainly a swarm for the quiet burbs. They served up three different meat sausages as well as one veggie. They had some drinks and possibly a breakfast sausage thing. The truck is rather nice and fancy, but man, is their logo unattractive. Seriously though, I had to think about it for a long time what the heck it was. Then I realized it was a sword with a sausage threw it. I am not a fan of it. I did not get this, but couldn’t not take a snap of this beauty. 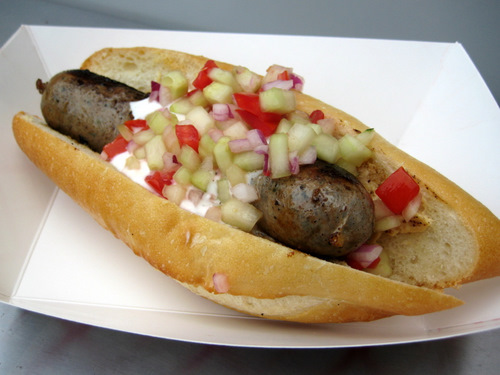 This is the tried and true country herb pork sausage. No fancy fixing, just tons of caramelized onions. Gosh, it’s pretty. I wish I had gotten this. It’s interesting how a man reacts when you ask to take a picture of his sausage! In this case, he said sure, and his wife said I was funny. 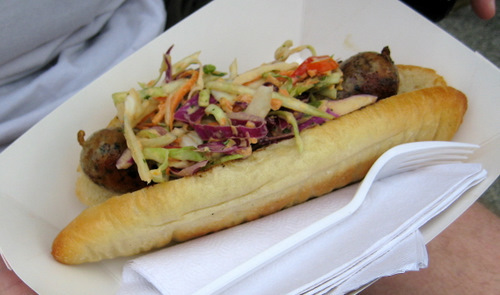 This was the asian chicken sausage, topped with a fancy looking mango slaw. This man was not so willing to accommodate me when I asked to take a picture of his sausage. He seemed annoyed and also puzzled, as if he couldn’t fathom why anyone would want to do this. I said if he minded I wouldn’t, but then he just let me anyway. It’s not like I asked him if it was alright for me to steal his sausage or stab him in the face. It was just a harmless photo. So loosen up dude! I got the lamb and beef mediterranean sausage. After much indecision and deliberation, the girl in the truck convinced me that for someone new, I was sure to like this. Well, I didn’t really like it all that much actually. I mean, the sausage itself, that was just fine. It just didn’t have the most flavor or anything, but I could taste that it was made with fresh ingredients and well grilled. The roll is too big. It’s just too big. And it’s too hard on the outside, so you can’t actually take a decent bite of it, unless you have a flip-top head. I feel it would be easier to enjoy if the roll was thinner and softer, and/or they split the sausage in half so you could take bites from each side. So my one big problem was just the pure logistics of eating this thing. The topping was also quite a disappointment. I expected it to be full of flavor and zesty and it was just meh. The veggies really did not have much flavor, it was surprising. I mean it’s onions and peppers and cucumbers. I at least expected the red onions to have at least a little something, but it was fairly weak, even for onions. And the tzatziki was also fairly weak. And I just realized there was supposed to be hummus on it. Do you see any? Well, maybe a tiny little speck. I certainly did not taste any. This place had gotten pretty good reviews, so perhaps I had high expectations. But I just wasn’t impressed. For the money, it is a decent value. This is a big sandwich and they definitely don’t skimp on size. But I just wan’t blown away. 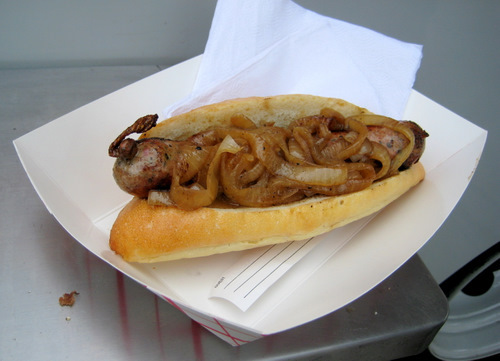 Like when I was at Rosamunde in San Francisco, their sausage blew me away. But unfortunately, I just can’t say that for Renaissance. I do want to try the plain pork one with caramelized onion to see if that one’s any better. Let’s hope it is. I felt the same as you with the veggie sausage: too much bread, and weak flavors and spicing.